Common ravens are playful. They carry sticks and feathers aloft, trade them back and forth in flight and drop and retrieve them in air. They will repeatedly slide single file down snow fields, seemingly just for the fun of it. The common raven (Corvus corax) is a member of a family of birds known as the Corvidae, which includes jays, crows, and magpies. In Alaska, the raven can only be confused with a hawk or the much smaller crow. Ravens have large, stout bills, shaggy throat feathers, and wedge-shaped tails, visible best when in flight. Common ravens are large passerine (or perching) birds that average 63 centimeters (25 inches) in length and 1.2 kilograms (2.6 pounds) in weight. Ravens in the Interior begin displaying courtship behavior in mid-January, and by mid-March adult pairs are roosting near their nesting locations. The female lays from 3 to 7 eggs. Only the female incubates the eggs; she is fed by the male while on the nest. The chicks hatch after about three weeks blind, featherless, and helpless: a characteristic known as altricial. They grow quickly, as both parents feed the young by regurgitating food and water which is stored in a throat pouch. About four weeks after hatching, young are ready to leave the nest, which is usually around the first week of June in the Interior. Young remain with parents after fledging. Ravens reach sexual maturity at 3 or 4 years of age and mate for life. Ravens are probably very long-lived in the wild; one captive bird died of old age at 29 years. Ravens are omnivorous, consuming a wide variety of both plant and animal matter. They are notorious scavengers and are common visitors to garbage dumps, although at times they are also predatory on small animals. Ravens will hide or cache food supplies, and will raid other ravens’ caches, creating social dynamics involving disguising caches and creating fake caches. They also have the habit, like most hawks and owls, of regurgitating undigestible food in the form of a pellet. 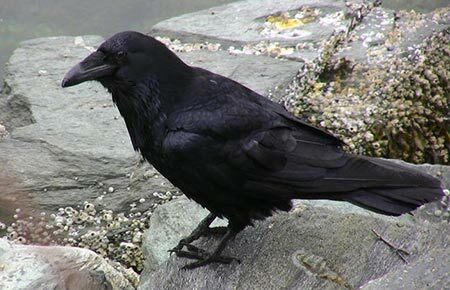 An analysis of hundreds of raven pellets from Umiat, Alaska, indicated that 50 percent of the raven's winter diet consisted of live prey (mostly small mammals) captured by ravens. Diets consist of grains, berries, fruit, small invertebrates, amphibians, reptiles, small mammals and birds. Ravens are excellent fliers, engaging in aerial acrobatics and sometimes soaring to great heights. Flight is often an alternation of wing flapping and gliding and is deceptively fast, as ravens move quickly with seemingly slow wing beats. In courtship flights ravens fly with wingtips touching, and repeatedly dive and tumble together. There is no mistaking the raucous call of the raven; the deep, resonant “kaw” or “prruk prruk prruk” is its trademark. However, the raven can produce an amazing assortment of sounds: mews, whistles, high-pitched cries, “glooks,” and dripping water sounds. One study in Alaska showed ravens have more than 30 distinct vocalizations. Ravens are among the most intelligent of all birds and can learn by watching, solve problems using logic, and recognize different individuals, human and raven. They are playful and carry sticks and feathers aloft, trade them back and forth in flight and drop and retrieve them in air; they will repeatedly slide single file down snow fields. They also interact in a playful fashion with other animals, including wolves and bears. This likely helps them when their scavenging puts them in close proximity to these predators. 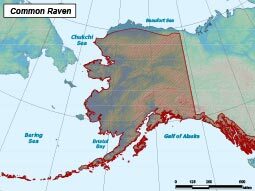 The raven is a year-round resident in Alaska, nesting from the Seward Peninsula and the Brooks Range throughout the mainland, south to Kodiak Island, throughout the Aleutian Chain and along the coast and mountains of Southeast Alaska. The raven is found throughout most of the Northern Hemisphere in many types of habitats, but seem to prefer forested areas adjacent to expanses of open terrain. Ravens often form loose flocks during the day and congregate for roosting at night. As many as 800 ravens have been seen in one roost near Fairbanks. When they are not breeding, they may travel 30 to 40 miles each day from roost to daytime feeding areas. Populations are stable or unchanging. Studies have suggested that ravens benefit from human activity and in areas of high development, numbers increase significantly. Grains, berries, fruit, small invertebrates, amphibians, reptiles, small mammals and birds. Owls, marten, and other ravens sometimes prey on raven eggs. Breed annually, female ravens lay 3–7 eggs in the spring.